I love my smartphone. The more I use it, the more I am convinced that its capacity to both save and waste time is nearly limitless. 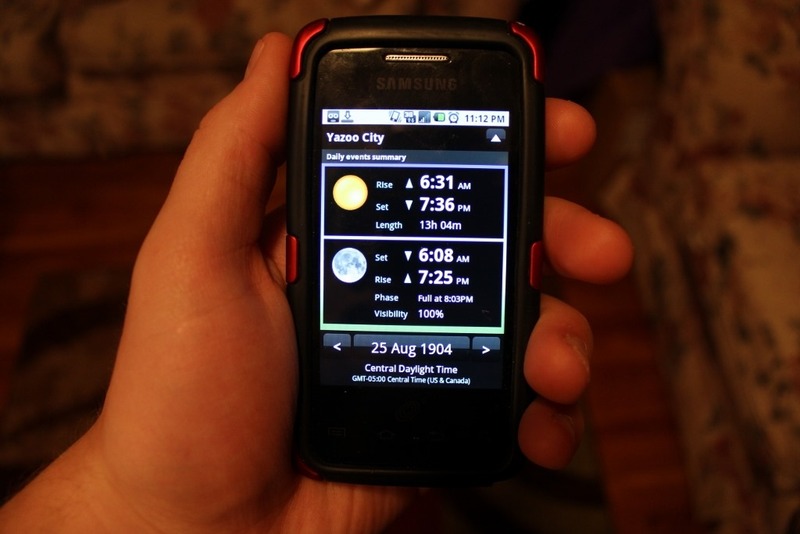 I have an app, for instance, that tells me when the sun and moon rise and set on a given date anywhere in the world. Did you know that on August 25, 1904, a waning gibbous moon set at 8:12 am in Yazoo City, Mississippi? If you have no idea where Yazoo City is, that’s okay—I have another app that can get you directions from wherever you are to there, and use my phone’s built-in GPS to guide you literally every step of the way. I can also tell you that Yazoo City was originally founded in 1824 as Hannan’s Bluff. I can tell you this because my phone can access the Internet, which is a magical repository of some of mankind’s most useless information. And that’s hardly the tip of the iceberg. With my phone, I can scan a product’s bar code and automatically price-check it against dozens of online sellers. I can point my phone’s camera at the world, and a combination of technologies can show me in real-time the nearest venues for food and entertainment. On a road trip, I can tell my phone to find me the cheapest gas stations along my route and then tell me how to get there. My phone is a calculator; my phone is a stopwatch; my phone is a calendar and a gaming system and a flashlight and a planner and a notebook and a thousand million other things. With the right app, my phone can do nearly anything. Despite having more processing power than the computer that first brought astronauts to the moon, there are certain limits to my phone’s capabilities. There’s a definite hardware limit, for starters. No matter what mind-boggling technological feat it might be performing, it can only perform it as fast as all its little transistors and circuits can keep up. It’s hard to think of a machine that can process multiple millions of instructions per second as slow, but it’s not that difficult for a whole slew of commands to turn my smartphone into a sluggishphone. It’s also limited by its software. The same apps that make my phone a multitasking machine are also a defining factor in what it can and cannot do. No matter how simple the task, without the proper app, I can’t get my phone to do what I want. And even then, there are some things that will forever be outside its scope. 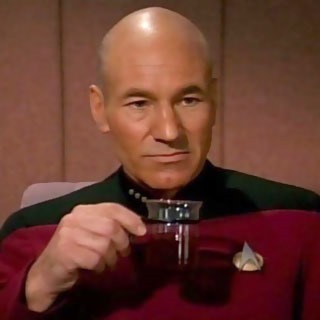 As awesome as it would be to tell my phone to materialize an Earl Grey, hot, no amount of programming is going to make that happen. Technology is only capable of so much—for some things in life, there simply isn’t an app. Let’s jump back a few millennia, to a time when the telegraph wasn’t even a twinkle in Pavel Schilling’s eye and the closest thing to cutting-edge technology was the scythe. God had promised a child to Abraham and Sarah, who at this point in their lives the Bible tactfully describes as “well advanced in age” (Genesis 18:11). So when God makes a point of promising Abraham, “I will certainly return to you according to the time of life, and behold, Sarah your wife shall have a son” (Genesis 18:10), Sarah (who was listening to the conversation from the other side of a tent), couldn’t help but laugh. A child? That train had left the station many years prior. To produce an heir at their age…it was simply impossible. God’s response to Sarah’s skepticism is a memorable one. He asks, “Is anything too hard for the Lord? At the appointed time I will return to you, according to the time of life, and Sarah shall have a son” (Genesis 18:14). A child at such an advanced age was certainly impossible by human standards, but God’s rhetorical question reminded both Sarah and Abraham, “With men this is impossible, but with God all things are possible” (Matthew 19:26). This birth should have been impossible—to continue with the smartphone analogy, Sarah’s hardware didn’t include what was necessary for the task at hand. But the Bible tells us that, after her initial doubt, Sarah found the faith to trust in God’s promise—and before too long, conceived a son “because she judged Him faithful who had promised” (Hebrews 11:11). The disadvantage with stories like these is we can hear them so often that we start to forget what they’re actually saying. Sarah gave birth to a son after nine decades of life. That’s a medical impossibility. It should not have, could not have happened—and yet it did. This account, set so early in the page of the Bible, reminds us succinctly that the God we serve is God of not just the improbable, but the impossible. Not that it should come as a surprise. God makes that clear in nothing short of the very first verse of the very first chapter of the Bible. One of the fundamental laws of science is that matter can neither be created nor destroyed, and God chose to begin the Bible with, “In the beginning God created the heavens and the earth” (Genesis 1:1). Sure, maybe the rest of the universe is bound by that whole “conservation of mass” law, but for God, creating something out of nothing is just the opening act of His entire narrative to humanity. You and I are a lot like smartphones. We’re defined by a certain set of hardware that can do some pretty impressive things, but is nonetheless limited in its potential. We can only move so fast, lift so much, and think so quick before we reach our upper limit. Also like smartphones, if we want to put that hardware to use, we require instructions. A phone receives those instructions in the form of an app—a fancy bundle of code that lets the phone know when and in what order to perform certain functions in order to achieve a desired goal. While there aren’t (yet) app stores for the human brain, we do put together our own sort of apps as we go through life. Want to make a peanut butter and jelly sandwich? You probably know the steps to get from here to there. You also know the functions required for a plethora of other skills you’ve picked up thanks to school, work, and all life’s other little training grounds. But as much as you can do, and as much as you’re still capable of learning, you have your limits. Want to leap over tall buildings in a single bound? Too bad; you can’t. There’s no amount of training that will get you there—it’s a simple impossibility. Well, at least for you. When God inspired the book of Genesis to be recorded, He made special note that during His recreation of the earth, “the Spirit of God was hovering over the face of the waters” (Genesis 1:2). That Spirit was the power with which God established (and occasionally circumvented) all the physical laws of the universe. That Spirit is the power with which God divided the light from the darkness, the water from the land, and the day from the night; the power with which He cast the devil and his armies from heaven; the power with which He raised His only begotten Son from the grave. It is not a power which is defined by the universe; it is a power which defines the universe. And so when Paul writes to the baptized members of God’s Church to say, “your body is the temple of the Holy Spirit [which] is in you, [which] you have from God” (1 Corinthians 6:19), maybe we can begin to understand the full magnitude of such a statement. Upon baptism, when we received God’s Holy Spirit, we received the same Spirit God used to command the universe into existence. Yes, our physical human hardware has limitations. Yes, we are only capable of learning and doing so much on our own. But as baptized members of the Church of God, we have access to the very power of God. As Christ told His disciples, “whoever says to this mountain, ‘Be removed and be cast into the sea,’ and does not doubt in his heart, but believes that those things he says will be done, he will have whatever he says” (Mark 11:23). We learn elsewhere in God’s word that our requests won’t be honored if they aren’t made in accordance with God’s will and mind, but the point remains that the power that shaped the universe is now working within every member of the Body of Christ. God taught Abraham and Sarah all those years ago that nothing is too hard for Him, and while times and technologies have changed, the Spirit of God has not. God has called us to be firstfruits in His eternal family—and by placing His Spirit “in our hearts as a guarantee” (2 Corinthians 1:22), He has given us the ability to overcome any and every obstacle in our way. Do we still have sins and personal flaws to overcome? Absolutely. Is it going to be difficult? You bet. Are we going to struggle with our own human nature and at times fall flat on our faces? Without a doubt! But is our journey impossible? You tell me. A smartphone can only do what its technology and installed applications allow it to do, but that’s just because no smartphone is able to access the very power that created the universe. As fancy as our phones are, there’s no app for that. And yet you and I have that Spirit embedded, not in our phones, but in our very beings. What can’t we overcome with that Spirit? What obstacles could possibly stand in our way? The thing about my phone is, none of those apps I mentioned earlier work unless I choose to use them. If I’m lost in the middle of the woods, and my phone can tell me exactly where I am and the quickest way to get back to civilization, but if I don’t turn it on and use it, it counts for nothing. Likewise, just because we might have access to the power of our Creator doesn’t mean anything unless we’re actively putting it to use in our lives. So what if you have the Holy Spirit? The real question is, what are you doing with it? Are you praying regularly and building your relationship with your Father? Are you daily opening your Bible and looking to learn from His word? Are you actively seeking to use His Spirit to become more like Him in word and deed? Because the simple truth is, when you draw near to God, He will draw near to you (James 4:8). And if you don’t, why should He? The fact of the matter is that if you are a baptized member of the family of God, you have His Holy Spirit. That’s the Spirit with which He parted the Red Sea, stopped the sun in the sky, toppled the walls of Jericho, gave sight to the blind, bestowed strength to the lame, restored the dead to life, and rent the temple’s veil in twain. That Spirit is working in you, and He has called you to join His family. If we’re like smartphones, that makes the Holy Spirit the most powerful app we could ever use. There are spiritual mountains between us and God, but He has given us the ability to cast them into the sea. Are you using your app?